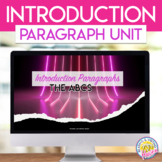 Break down the introduction paragraph for students using this 29-slide PowerPoint. Using a funnel an as analogy, the introduction paragraph is broken down into three parts: the hook, the background, and the thesis statement. A plethora of examples are provided as well as a short quiz (key included). 24 Slide PowerPoint on how to write an introduction paragraph. Shows students how to unpack a prompt and examples of how to write an introduction paragraph, a quick write, and a follow up prompt for them to apply what they've learned. This quick one page example from Preserving Civilization walks students through the process of writing a great introduction for a research paper. It provides a sample introduction with a detailed map of what that introductory paragraph should include. Fully editable. So easy and alien can do it! 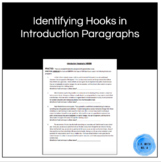 Includes four introduction paragraph examples in which students can practice identifying the hook, and what type of technique was used to write the hook. 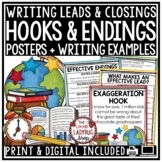 Great for reinforcing a lesson on the different types of hooks in informational or argumentative writing! This product is a handout to be given to the students. It includes the blank handout, teacher instructions, a handout with example answers, and a sample introduction paragraph. This PowerPoint slideshow provides students with notes on how to write a strong introduction paragraph and hook / attention grabber. It also includes examples of strong hooks. 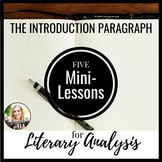 This handy guide walks students through how to write strong introduction paragraphs. The examples are specific to the unit I taught my classes, but they can be changed to whatever makes sense for you and your class. 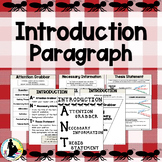 This was created to teach students how to use a graphic organizer to write body paragraphs for a five paragraph essay. It includes a tip on using transitions. It matches the content for my Introduction to a Five Paragraph Essay PPT.